Ten years ago, on February 19, 2002, the Thermal Emission Imaging System (THEMIS), a multi-band camera on NASA's Mars Odyssey orbiter, began scientific operations at the Red Planet. Since then the camera has circled Mars nearly 45,000 times and taken more than half a million images at infrared and visible wavelengths. "THEMIS has proven itself a workhorse," says Philip Christensen, the camera's designer and principal investigator. Christensen is a Regents' Professor of geological sciences in the School of Earth and Space Exploration, part of Arizona State University's College of Liberal Arts and Sciences. "It's especially gratifying to me to see the range of discoveries that have been made using this instrument." THEMIS combines a 5-wavelength visual imaging system with a 9-wavelength infrared imaging system. By comparing daytime and nighttime infrared images of an given area, scientists can determine many of the physical properties of the rocks and soils on the ground. Mars Odyssey has a two-hour orbit that is nearly “Sun-synchronous,” meaning that Odyssey passes over the same part of Mars at roughly the same local time each day. In September 2008 its orbit was shifted toward an earlier time of day, which enhanced THEMIS' mineralogical detection capability. Says Christensen, "Both Odyssey and THEMIS are in excellent health and we look forward to years more science with them." NASA launched the Mars Odyssey spacecraft April 7, 2001, and it arrived at Mars October 24, 2001. On arrival the spacecraft spent several months in a technique called aerobraking, which involved dipping into the Martian atmosphere to adjust its orbit. In February 2002, science operations began. The Mars Odyssey project is managed by the Jet Propulsion Laboratory, a division of the California Institute of Technology, Pasadena, for NASA's Science Mission Directorate, Washington. Lockheed Martin Space Systems in Denver built the spacecraft, and JPL and Lockheed Martin collaborate on operating it. This was the first science image taken by THEMIS, February 19, 2002. 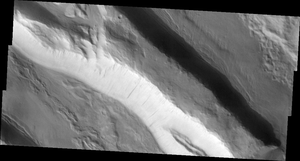 It shows an area in Acheron Fossae, north of the giant volcano Olympus Mons, where mesas and valleys lie bounded by geologic faults. The image (V00816002) shows an area 11 x 6 miles (19 x 9 km); the smallest details visible in the original image are 59 feet (18 meters) wide. 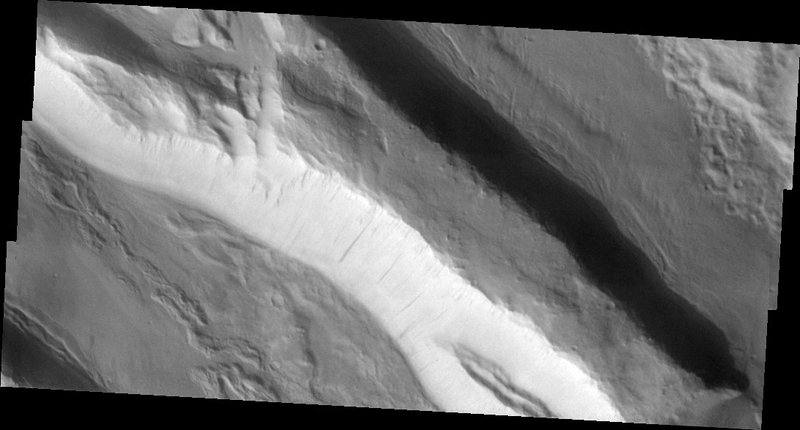 Taken on THEMIS' 10th anniversary, this image (V45173011), shows a region in Nepenthes Mensae, part of Terra Cimmeria. The view depicts a knobby landscape where the southern highlands are breaking up as the terrain descends into the northern lowlands. The image covers 11 x 32 miles (19 x 52 km); the smallest details visible in the original image are 59 feet (18 meters) wide.